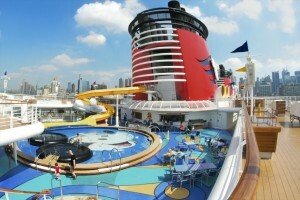 Welcome back to our live blogging from the Disney Dream. Today is the first full day on board, the 2nd night of a 3-night cruise. The ship docks in Nassau today. It’s hot, but we’re already gotten a run in on deck 4! Yesterday was a typical first day. We arrived at Port Canaveral around 11 AM and after we checked in with the other Castaway Club members, we were able to board as we had signed up for an earlier boarding group during online check in. We grabbed a quiet breakfast/lunch at Enchanted Garden, which is our preference to going up to Cabana’s buffet. After that, we headed to the Spa to purchase our Rainforest Passes. At 1:30 we were able to drop our day bags off in the room. My Remy reservation confirmation was on the cabin door, which is good because I’d forgotten I’d made that for the 3rd night. We hung out in the cabin (deck 8 forward, with nice easy access to the spa) until the life boat drill, which is from 3:45 to about 4:10. You start gathering at 3:45, and it starts at 4PM. After that we headed back to the room to change for the spa. The spa was a little hectic at first because people were still showing up for the tour. And then there were the people who didn’t know how to use their inside voices in a spa, but eventually things cleared out and it was nice. Because of the time of year, it was still daylight when we left at 6:30 to change for dinner and a drink. I really like the rainforest when it’s dark out, may skip dinner tonight for it. We dressed and headed down to Pink for a before dinner drink and met Myra from the Philippines, who is on her 2nd week with Disney after 10 years with Holland America. Lots of people were checking out the bar, but we were the only ones who stayed for a drink. 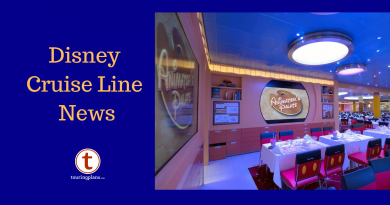 Then it was a stop at Guest Services to cancel the forgotten Remy reservation – I love Remy but we haven’t hit all the main dining rooms on the Dream in a while. At Enchanted Garden, we were seated with 2 other couples, all traveling without children. Everyone was in the same age group, so you can tell there is a method to how Disney matches you up. As a vegan, I’m getting pretty weary of my dining choices at the main dining room, because I end up eating the same things every cruise. We were pretty tired after dinner and went to bed instead of going back to the District. Today we’re going out on our own in Nassau to research some things guests can see and do on their own instead of doing port adventures, which we think are mediocre, expensive, or both for this port. We are going to see if we can entertain ourselves on foot. 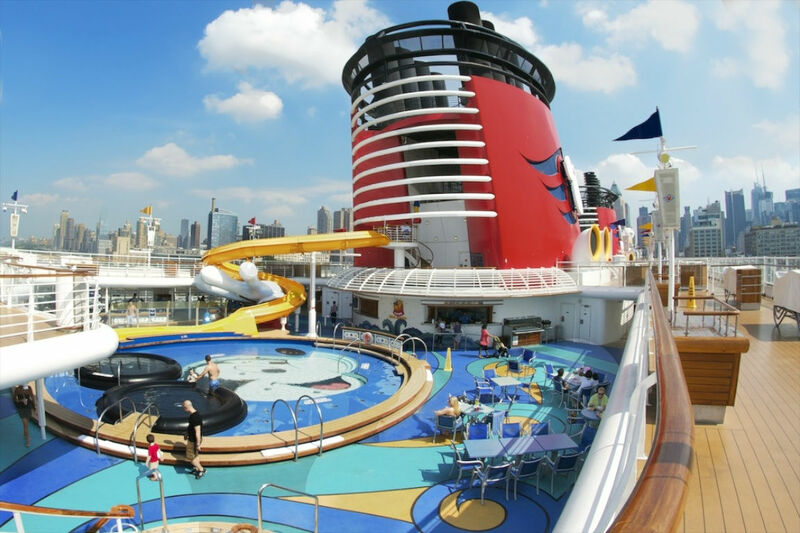 Let us know if you have any questions about our cruise and we’ll try to answer them. Hope you had a good time in Nassau. A couple of weeks ago, we held our breaths thru the tourist trap area, then walked along the beach (stopping for coconut milk from a fresh coconut) and then up to the Fort to wander around. We found it quite interesting – as my husband said, you’d never have such free rein to a fort like that in the states due to safety concerns! The display info is pretty thorough. Caution: the fort is not on Arawak Cay like Google says. It’s up on the hill on the other side of the road. Just down the hill from the fort is a restaurant called Twin Brothers with quite good conch fritters. On the way back, we wandered along the street where most of the churches are – much nicer than walking along the shops – and found a market to pick up curry powder. Great selection! And so interesting to have the checkout clerk sitting in a chair, eating her lunch, talking on the phone and checking us out! Also, if you go back to Pink, would you see if they’ll let you take a photo of the Cremant d’alsace Blanche de blanc champagne label? We didn’t jot down enough info to find it again! (We do have a pic of the menu after all). Thanks a bunch, and have fun! Yep. On it tonight. By the street with churches, do you mean around West and Delancey? Where St. Xavier and the Greek Orthodox churches are? Just found this. Do jealous. I do have a question though please cx. Daddy says you are staying on for another four day? When you go to Nassau I always have my hair braided in the official area by the port. I always ask for speedy. She quotes daddy $50 but he says $20 max and they do it. Is speedy still there? And if so would you try it?